Description: What a thoughtful hostess gift for parties year round! 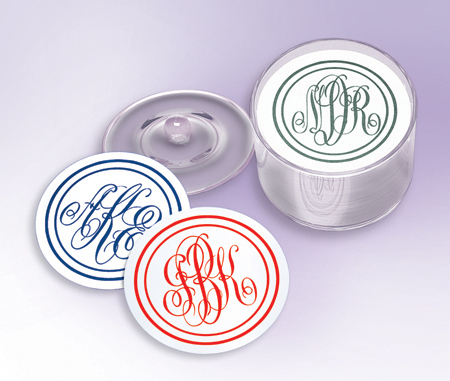 Heavy paperboard coasters with a monogram and matching border and an optional clear acrylic holder with lid. Both create a perfect bar accessory for any décor. 100 coasters per order. Specify black, red, blue, navy, hunter, wine, lime, bimini blue or silver ink. Coasters measure 4" in diameter.